Parent's Choice Inflatable Safety Bathtub is a great choice for bath time for home and on-the-go. The tub deflates easily for flat storage or travel and has a spacious pocket for all of your child's bath time essentials. Ideal for children 12-24 months, it features a large, supportive back and headrest for hassle-free hair washing without getting soap in your little one's eyes. The tub also has an easy-to-read thermostat to monitor the water temperature while bathing to prevent bathtime burns. The tub is made from phthalate-free plastic and has a ribbed, non-slip bottom to prevent injuries. 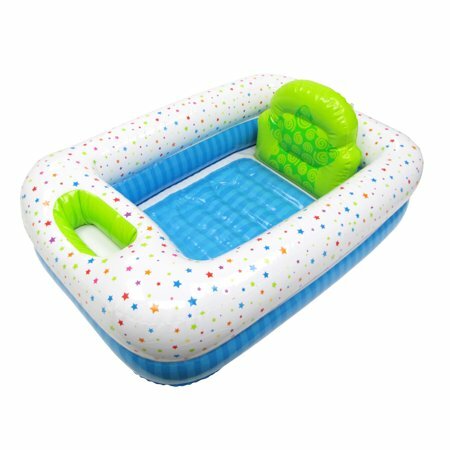 Plus, at this affordable price, you can buy extra inflatable safety bathtubs to keep at grandparents' homes, vacation spots, daycare, or anywhere else your little one may need a bath. Make an investment in your child's safety with a Parent's Choice Inflatable Safety Bathtub. <br /> <br />Parent's Choice provides parents with baby and toddler products you need at a price that won't push your budget over the edge. We offer everything you need from bath time to bed time and every time in between, all with the high quality we know your little one needs. Parent's Choice is conveniently available online and in Walmart stores nationwide, allowing you to stock up, save money and live better. Parent's Choice Inflatable Safety Bathtub is a great choice for bath time for home and on-the-go. The tub deflates easily for flat storage or travel and has a spacious pocket for all of your child's bath time essentials. Ideal for children 12-24 months, it features a large, supportive back and headrest for hassle-free hair washing without getting soap in your little one's eyes. The tub also has an easy-to-read thermostat to monitor the water temperature while bathing to prevent bathtime burns. The tub is made from phthalate-free plastic and has a ribbed, non-slip bottom to prevent injuries. Plus, at this affordable price, you can buy extra inflatable safety bathtubs to keep at grandparents' homes, vacation spots, daycare, or anywhere else your little one may need a bath. Make an investment in your child's safety with a Parent's Choice Inflatable Safety Bathtub. Bigger than i expected. Great for traveling if needed. You have to blow it up as you may know it doesn't come with anything to blow it up lol. But it only takes 10 min tops to blow up which is fine as typically you won't be using this for everyday bathing. This little tub is great. I don't know how long it will last but my little one fits in it and she likes it so I'm happy. I did realize that you have to put more air in it after about 3 baths though, but that's ok. Perfect transition for my little one. Fits perfect in my bath tub. Gets a little slippery when full of suds but very happy with this purchase. we bought this for a float in our pool for our dog. He always wants to be in the pool with us but doesn't always want to be in the water. This is perfect!! This tub is perfect for my grandbaby. Fits get in our bathtub and is easy to drain and dry.